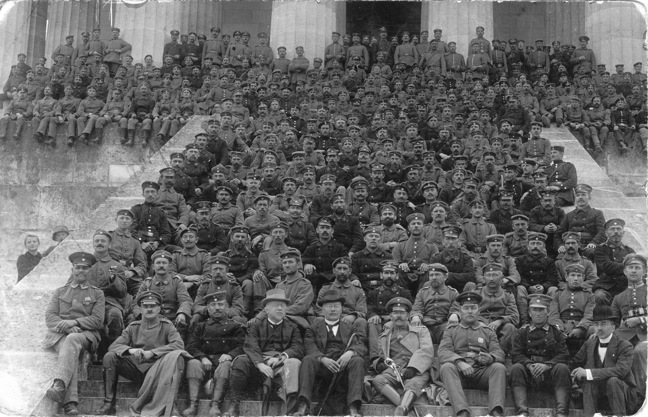 I found this postcard of a group of soldiers taken in 1916, two years after WWI began. It was among a group of photographs of Conrad and Lena’s. I looked hard at enlargements to see if Papa was in it, but was never sure because he was not in every photo he owned. When I had the message on the back translated I learned it was sent to Lena with the message: “I’m in this picture. 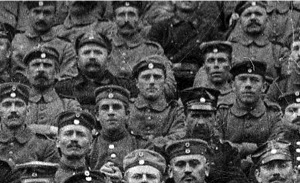 Can you find me?” Armed with this information and more experience in seeing old photos of that era, I did find Konrad. Another pdf version of this story with other photos of Conrad and his sister Barbara is here. 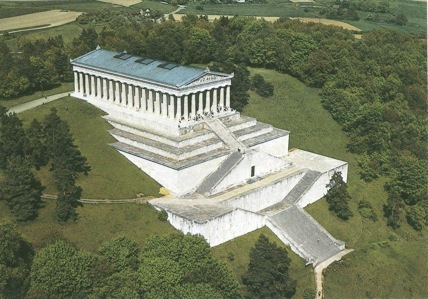 Valhalla is a German temple to its heros of government, military, and culture. It was built beginning 1830 and sits on the banks of the Danube just below Regensberg. The group photo was taken on the upper steps visible here. I made a road trip to visit the place last week (October 2006). My photos are on the next page.